Motorola Moto Z Force Droid 32GB Unlocked Smartphone Fine Gold XT-1650M. 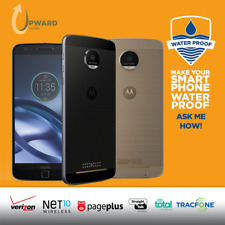 - Motorola Moto Z Force Droid XT-1650M Smartphone - Gold - Unlocked. With another carrier?. Motorola Moto Z Droid - 32GB - Gold/White (Unlocked) Smartphone. Screen protector on it and another one and a case included. Hotspot compatibility may vary between carriers. Phone works on verizon as well. Up for sale is a Motorola Moto Z Force Droid (XT1650-02) 32GB Black (Verizon) Smartphone - The phone is fully functional and works great. - There is a VERY FAINT image burn on the LCD srcreen. The image burn can only be seen when the phone is in landscape mode. WAS RESET BACK TO FACTORY SETTINGS AND IS READY FOR THE NEXT USER! WILL NOT WORK FOR SPRINT . The screen will have many light scratches and/or areas of obvious deep scratches. The body may have many deep scratches, large dents, corner dings, and other signs of heavy wear. None of these issues affect the phone's functionality. Phone shows normal signs of use including scratching on the housing, dings on the corners as well as scratches on the screen that might be lightly visible when the phone is turned on. If you have any problems we will replace your item. It is available in black/lunar grey. 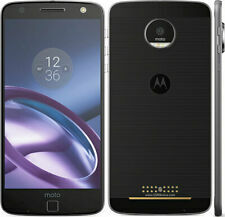 Family Line Motorola Moto Z Force Droid. Storage Capacity 32GB. Network Verizon. Color Black/Lunar Grey. Network Technology CDMA, GSM / EDGE, HSPA , LTE, UMTS. Network Generation 2G, 3G, 4G. Operate on either 850MHz, 1900MHZ or both depends on the region in US. Most GSM Carriers outside US operate on 900MHz, 1800MHz or both. Battery (installed). Motorola Moto Z Force Droid XT1650M - 32GB - Black/Lunar Grey (Verizon). Condition is Used. Shipped with USPS Priority Mail. Excellent Condition (No Scratches on the screen). It works on the Verizon network. Battery cove r. SIM cardNOT included. Condition: Used. Tested and worked. The display has dent (see photo). But the phone have good condition. Have small scratches on the case. Description: Motorola Moto Z Force Droid XT1650M 32GB Verizon (Lunar Grey) What’s included: Motorola Moto Z Force Droid (Lunar Grey) only. What’s not included: Original box, charger and documents. Original box and packaging: No. It works on the Verizon network. The screen is cracked and has a black spot, but everything else works. Battery cove r. SIM cardNOT included. Condition: Used: Has very minor dents on screen. Still works and looks great! Description: Motorola Moto Z Force Droid XT1650-02 Verizon. What’s included: One Motorola Moto Z Force Droid Verizon. What’s not included: Charger, Earphones, Documents, Etc. Original box and packaging: N/A. Motorola Moto Z Force Droid XT1650M - 32GB - Black (Verizon). May shows signs of use, light/heavy scratches on display and body. Trending at C $88.58eBay determines this price through a machine-learned model of the product's sale prices within the last 90 days. Motorola Moto Z Force XT1650-02 Black/Lunar Gray! For Verizon and GSM Carriers! Originally Verizon now GSM Unlocked! Motorola Moto Z Force XT1650-02 Black/Lunar Gray! For Verizon and GSM Carriers! Used device! There is heavy ghost image (background image) is showing up on the screen- it's a discoloration of areas on an electronic display. Includes 30 day warranty. Used. Fully functional. The item may have some signs of cosmetic wear, but is fully operational and functions as intended. See pictures for reference. Comes with generic charger. B0769 351854085123540SV. Unlocked Cell Phones. Motorola Moto Z Force Droid Verizon Unlocked GSM 32GB XT1650-02 Clean ESN Cell Phone. Verizon Cell Phones. Phone Body & Screen Protectors. Certain phones will require a sim card or an existing smartphone data plan. It works on the Verizon network. The screen has a dark spot and is cracked, back is cracked and scratched, edges are cracked, but everything else works. Battery cove r. SIM cardNOT included. The screen will have many light scratches and/or areas of obvious deep scratches. The body may have many deep scratches, large dents, corner dings, and other signs of heavy wear. Design by Sally Milo - MiloDesign. Motorola Moto Z Droid phone Locked Verizon XT1650-01. Tested Works. It works on the Verizon network. SIM card NOT included. B1456 354107071517192 SC. Black Unlocked Motorola Moto Z Force Droid Verizon 32GB XT1650-02 Cell Phone Clean ESN. Verizon Cell Phones. Phone Body & Screen Protectors. Device is DEFECTIVE. Defective power button. Certain spots of the touch screen are not functioning at all. Screen has scratches and indentations. No Sim card. CAN NOT CONNECT TO WiFi AND BLUETOOTH, BATTERY DRAINS TOO FAST , other than that the phone is functional and in overall good condition with a few light blemishes on the screen and a fair amount of nicks and scuffs on housing and back of the phone - check out pictures. Lcd has black dot. AS-IS NO FURTHER TESTS. 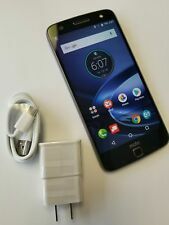 Up for sale is a Motorola Moto Z Force Droid (XT1650-02) 32GB Black (Verizon) Smartphone - The phone is fully functional and works great but there is an image burn on the LCD screen. The image burn is easier to see on light screens. Light image burn. The screen will have many light scratches and/or areas of obvious deep scratches. The body may have many deep scratches, large dents, corner dings, and other signs of heavy wear. Fully Working (minor issues). Up for sale is a Motorola Moto Z Force Droid (XT1650-02) 32GB Black (Verizon) Smartphone - The phone is fully functional and works great but there is a small dark dot on the bottom of the LCD screen. The screen will have many light scratches and/or areas of obvious deep scratches. The body may have many deep scratches, large dents, corner dings, and other signs of heavy wear. Fully Working (minor issues). Up for sale is a Motorola Moto Z Force Droid (XT1650-02) 32GB Black (Verizon) Smartphone - The phone is fully functional and works great but there is an image burn on the LCD screen. The image burn is easier to see when the screen is light in color. Light image burn. The screen will have many light scratches and/or areas of obvious deep scratches. The body may have many deep scratches, large dents, corner dings, and other signs of heavy wear. Manual, SD Card, SIM Card.